The word rood is Old English for the cross on which Christ died. The Dream of the Rood, for example, is an Old English religious poem, and some passages from it are carved in runes into the 8th century Ruthwell Cross in Scotland. The town of Ruthwell itself gets its name from the Old English words rood and wella (cross by a spring). Rudston in Yorkshire takes its name from its own stone cross. 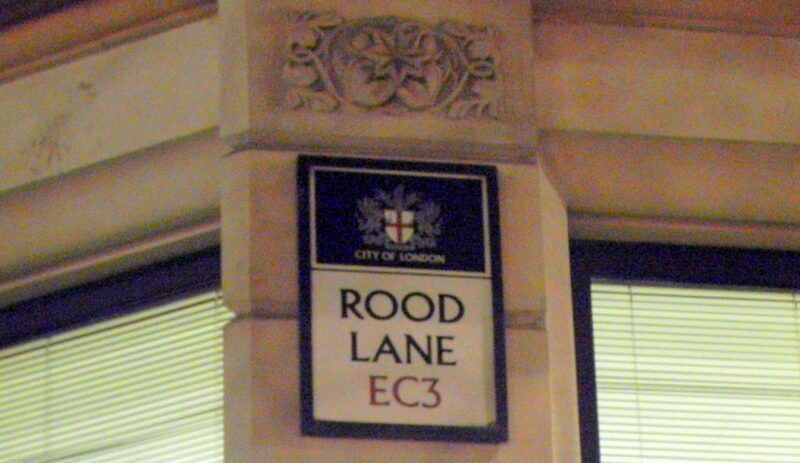 In London, on Rood Lane, there was once – surprise! – a cross. It stood in the churchyard of St. Margaret Pattens until 1538. St. Swithin was a 9th century Anglo-Saxon bishop of Winchester whose tomb at the old minster in that city was a site of pilgrimage. A kind of popular cult formed around this saint, although we really know very little about him. There are still many churches in England dedicated to St. Swithin, and London’s church dedicated to him stood at the corner of Vicus Sancti Swithin and Candelwryhttstrate as far back as the 13th century. It was destroyed in the fire of 1666, but a new St. Swithin’s designed by Christopher Wren took its place. The church, alas, did not survive the bombs of WWII. At war’s end only the pulpit was salvageable, and the church’s ruins were finally demolished in 1962. 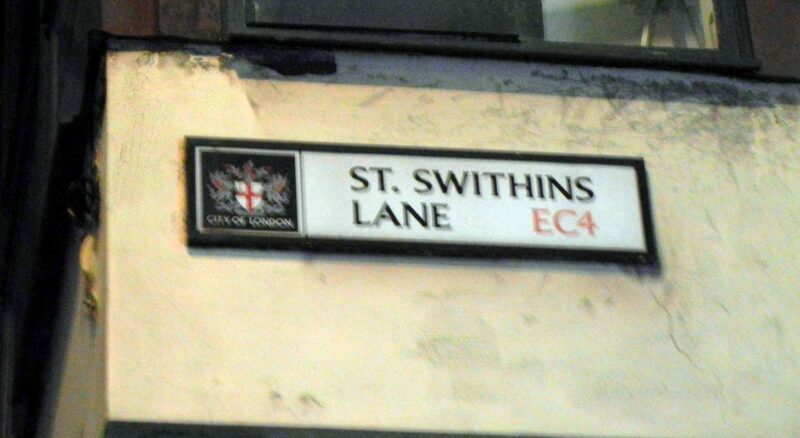 But the name of the beloved Anglo-Saxon saint, Swithin, is still remembered in St. Swithin’s Lane. 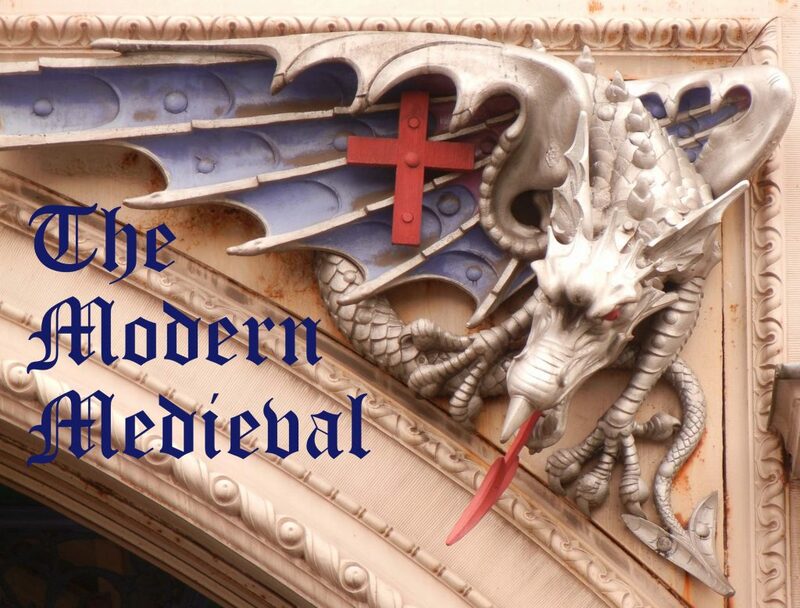 This entry was posted in History, Medieval and tagged Angl-Saxons, London. Bookmark the permalink.